WHAT IS THE RHYS METHOD®? The Rhys Method® is a profound system of practical techniques and knowledge that shows you how to have a clarity of purpose and courage to do what it takes to achieve it and increase your personal energy and power so you can persevere in life when others would have given up. 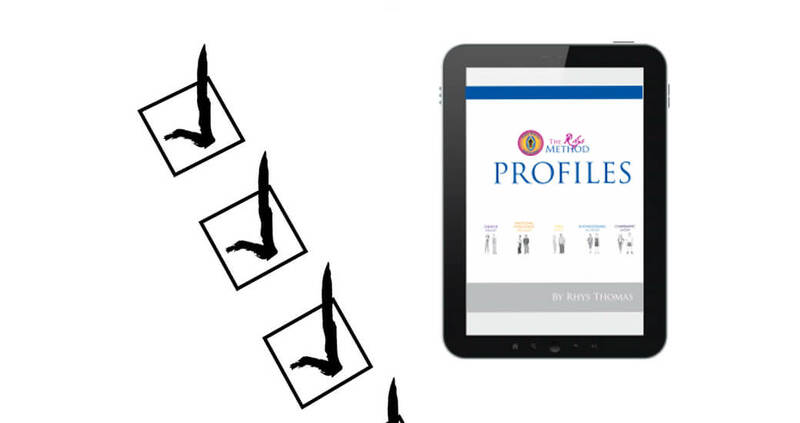 Rhys Method® Life Purpose Profiles – Is the foundation for your unbendable clarity of purpose that you will know as your life purpose through how it feels and not simply through a mental concept of who you should or shouldn’t be? The Profiles are what Carl Jung called the “primary archetype” within each of us that gives us a deep felt sense of purpose and inner peace. Discovering you profile accelerates your success in every area of your life. Rhys Method® 12 Chakra Gateways – Every second of every day your 12 gateways tell you exactly what to do to live your life purpose. The Rhys Method® 12 Chakra Gateways give you the translator to their many voices so you can move beyond guessing and procrastinating about what you should do and instead be called in each moment to do it fearlessly.The 12 Chakra Gateways are your life energy that you experience through your body, intuition, drive, passion, compassion, love and brilliance when they are open. They are the stuck, sabotaging — and destructive — forces in your life when they are blocked. The Rhys Method® 12 Chakra Gateways go far beyond other chakra training systems to give you practical step by step ways to clear the blocks that keep you from the energy you need to live your life purpose.What if you knew without a shadow of a doubt what you have chakras for? You could look at any decision or situation and see what actions you are truly called to. And if you knew all the things you do not have chakras for, you could avoid living a trial and error life and be sure that the next life choices you make will enhance your career, your relationships and your health. ! Rhys Method® Crystal Bowl Sound Healing Rhys Method Crystal Bowls are the simplest way to find inner peace and freedom from your internal mental chatter and simultaneously train yourself to be open to your chakra guidance. The healing and soothing tones of the Rhys Method Crystal Bowls are used at every level of self discovery at the Rhys Thomas Institute. You can’t think who you are, you must feel who your are. Every time you listen to crystal bowls, you will experience your life and guidance at a level you have never felt before. Each aspect of the system is exclusively used in the Rhys Thomas Coaching Programs and at the Rhys Thomas Institute to train coaches, business owners, managers, leaders, energy master practitioners and others with the most cutting-edge knowledge and techniques (including energy healing methods) available in the world today. WHERE DID THE RHYS METHOD® COME FROM? The Rhys Method® system is based on Rhys’ personal mastery studies covering the areas of energy mastery, martial arts, sound healing, professional tennis, coaching, personal struggle and trauma, his “Big Why,” public speaking, business and teaching. It wasn’t enough just to have the experiences, I also wanted to understand and teach it myself. So I have integrated the teachings of hundreds of the top masters, authors and transformational leaders of our time as well as the wisdom of ancient sages to synthesize a new, direct, no-nonsense program. WHO IS THE RHYS METHOD FOR? The Rhys Method® is designed for those who are tired of the quick-fix gurus and for those who want to see lasting and permanent change in their lives. It is for anyone who is ready to leap into their personal power to create conscious relationships and passion-based careers and businesses by living fearlessly and finding their deepest purpose in life. Most people are living with the pain of not knowing who they are. Who you are is your life purpose. Your life purpose is the greatest gift you will ever offer the world. Discovering your spectacular, defining quality is what the Rhys Method® is all about. Transformation and attaining success, passion and joy in your life are easier than they might appear. The biggest barrier is in not knowing your life purpose or how to really discover and nurture it. When you do not have a sense of purpose, what you do, rather than who you are, defines you and becomes your life focus. Your life purpose quality is what transforms you from a technician doing a job to a master applying their personal insights and knowledge to their craft. Knowing your life purpose is the quality that separates a Gandhi, a Martin Luther King, Jr or a Mother Teresa from others who try to do a job but do not understand their true mission in life. It is the only thing that will give you lasting happiness and joy. Your life purpose is all you truly will ever need to achieve. It is the success you dream about and it offers you mastery in your life at the material, emotional and spiritual levels. The Rhys Method® system is designed to initiate and attune you to a more powerful and conscious way of living. Our programs, courses, products and other resources will give you simple guidelines to help awaken your ability to self motivate and listen to your internal signals rather than to your fears and what others are doing or thinking about you. In order to follow your dreams, you must be able to be willing to feel and create your dreams in each moment. Yesterday’s dream is ancient history; today is the day you create your future. Of course, these programs cannot replace the deep learning, personal process and group work that happens at the Rhys Thomas Institute and in the Rhys Thomas Coaching Programs. Instead, they provide an opportunity to begin the process of personal growth and transformation as well as to serve as a great compliment for our students. I invite you to explore all of the life-changing and life-enhancing opportunities that are offered here!